By working together, we can help to end bullying in schools and in the workplace. Please join us in supporting Pink Shirt Day on Feb. 27, 2019, and learn about how you can help to stop bullying in communities across the province at http://www.pinkshirtday.ca. The best possible environment for working, learning and living is one in which respect, civility, diversity, opportunity and inclusion are valued. Everyone at the University of British Columbia is expected to conduct themselves in a manner that upholds these principles in all communications and interactions with fellow UBC community members and the public in all University-related settings. One of UBC’s initiatives to support a respectful environment is the Bullying and Harassment Prevention website. The website has information and training for UBC faculty, staff and student employees to support a positive workplace. The UBC community works together every day to build a respectful environment for all. On Feb. 27, wear pink to show your support for an end to bullying and harassment in our communities. Are your working, learning or living environments welcoming to LGBT2SQIA+ students, staff and faculty? Would you like to learn more about how to improve and positively impact the climate for sexual and gender diversity at UBC? Feb. 14, 10:00 a.m. – 12:00 p.m.
UBC is committed to advancing equity and inclusion across the university. The Equity Enhancement Fund enables faculty, staff, and students to play an active role in this effort by providing them with up to $25,000 in funding for community-based, collaborative projects. You are invited to submit a proposal by Feb. 28 to take part in advancing inclusive excellence and fostering an equitable and inclusive community. An information session will be held on the Vancouver campus and will be live-streamed in the Okanagan on Feb. 13 to provide an opportunity to learn more about the Equity Enhancement Fund and inclusion efforts at UBC. If you have questions regarding this fund, or equity and inclusion generally, contact eef@equity.ubc.ca. At UBC, diversity is welcomed and respected, and considered foundational to excellence in research, education and engagement. UBC recognizes that respect and support for transgender and gender-diverse faculty and staff are central to their success and wellbeing. It is our interactions at work that can help us to feel a valued member of society. The recognition of gender diversity, specifically for people who identify as transgender, two-spirit or non-binary, affirms and acknowledges that gender is highly personal and fluid, and is worthy of respect at UBC. All human resources practitioners and managers/supervisors have the responsibility to provide a welcoming, inclusive and respectful work environment. By working proactively with an employee who wishes to transition and/or utilize gender-affirming procedures, you can help create a positive experience for the individual and all employees in your unit. The information in the following resource documents can to help you to building a positive work environment and in modelling behaviour that shows respect for diversity and inclusion that you expect your staff to demonstrate in their relationships with each other and the people they work with across the campus. Please familiarize yourself with these resources so you can best support transgender and gender-diverse staff, faculty and student employees in your department. If you have any questions, please contact your HR Advisor. For more information on campus-wide initiatives on gender diversity, please visit the Equity & Inclusion website. HR is hosting a one-day workshop focusing on Selection Interviewing: Ensuring Equity, on Oct. 16, 2018. This workshop is designed for managers and administrators who currently have responsibility for the hiring and selection of staff. The cost of this workshop is $25 (includes refreshments and a light lunch). The interview is a vital step in the hiring process, so you want it to be as effective as possible. This workshop will focus on the essential skills of behavioural interviewing so that you can more effectively get to know your candidates and find the best fit for your team. Participants will also review current Human Rights and Employment Equity legislation and discuss the objectives of UBC’s policy on employment equity. Date: Oct. 16, 2018, 9:00 a.m. – 4:00 p.m.
Each August, communities across Vancouver come together to kick off the annual Vancouver Pride Week. At UBC, you are invited to join in the celebrations, and show your support for creating positive space across UBC. UBC’s annual Pride Convergence: July 30, 4:00-6:30 p.m.
UBC Pride: Aug. 1, 4:00-8:00 p.m.
Visit https://equity.ubc.ca/celebratepride/ to learn more and register. Explore how you can positively impact the climate for sexual and gender diversity at UBC and make our learning, working, and living communities more inclusive to all. Aug. 15, 2018, 1:00 – 3:00 p.m.
Sign up for free on the UBC Equity & Inclusion Office website. July 19, 2018, 1:00 – 3:00 p.m.
UBC’s Indigenous Research Support Initiative (IRSI) invites individuals from Indigenous communities, UBC faculty and UBC staff to express their interest for an advisory role as part of IRSI’s Indigenous Advisory Committee. The ISRI commits to enabling collaborative research, better practices of engagement, and supporting research excellence. The purpose of the Advisory Committee is to provide culturally-relevant advice, leadership and guidance to the staff and leadership team of the IRSI on matters relating to but not limited to: strategic direction of the network, research and ethics protocols, community outreach, governance, procedures and processes of the network. We have four spaces left in our May 11, 2018, session on Selection Interviewing: Ensuring Equity. Register ASAP to sharpen your interview and recruitment skills. Note that this workshop is designed for UBC managers/administrators who have responsibility for the recruitment of staff. May 11, 2018, 9:00 a.m. – 4:00 p.m.
UBC has been recognized as one of Canada’s Best Diversity Employers in 2018. These awards recognize Canadian companies that stand out through their efforts to create inclusive and respectful workplaces. Learn more about this recognition and the reasons UBC was selected at http://www.hr.ubc.ca/blog/2018/03/ubc-named-one-of-canadas-best-diversity-employers-in-2018/. If your unit/department will be hosting a Halloween party this year, please keep in mind some considerations about costumes. Be considerate of others by avoiding costumes that could be seen as culturally insensitive, sexist, or racist. We can all play a part in making our campus community a respectful environment. Each year on Sept. 30, we recognize Orange Shirt Day as an acknowledgement of the harm that the residential school system did to thousands of indigenous children. At the same time, Orange Shirt Day has come to mean more – it is an opportunity to do anti-racism work and to reinforce anti-bullying policies; it is a time to come together in reconciliation and truth. Join us at UBC by wearing orange on Friday, Sept. 29. 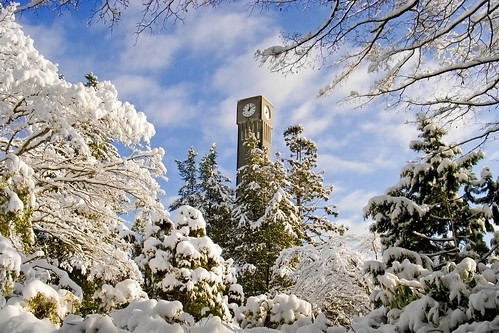 This winter at UBC, in addition to Christmas, our community is celebrating events and holidays from around the world. Our students, staff and faculty come from many cultural backgrounds and faith identities, and at this time of year, we have an opportunity to celebrate the cultures that make up our UBC community. Some of the major events at this time of year are beginning in the upcoming weeks, including Hanukkah (Judaism), Yule (Paganism), Mawlid an Nabi (Islam) and Christmas (Christianity) are in just a few weeks’ time. In January, we will see festivities for the Lunar New Year (Confucian, Daoist, Buddhist). See the full Days of Significance list to see all the events and celebrations coming up soon. At this time of year, there is a great opportunity to celebrate the season together, in a respectful and positive way that includes everyone and can help us all build intercultural understanding. Display a multi-cultural calendar in your workplace to raise awareness of important cultural/faith events and holidays throughout the entire year. Be flexible with the needs of different staff around faith and/or holiday celebrations. In your workplace or at celebration events, bring together decorations and food from the different cultures in your workplace, and encourage staff to share stories about their favourite traditions. Ensure your office is accessible and make sure decorations do not prevent or block access to public services. Consider how your office might celebrate dates significant to the members of your workplace community. When providing ideas for decorations, you can include Hanukkah, Kwanzaa and Solstice as well as Christmas. Refer to the Days of Significance calendar. Invite staff from all faith identities to be involved in the office decorating discussion. If you are feeling excluded as a result of office celebrations, you are encouraged to reach out to a colleague or a supervisor and have a conversation about how you feel and how you would like your culture or beliefs to be included. At UBC we should all feel comfortable to share our culture and beliefs with others. You are welcome to contact the Equity and Inclusion Office or your HR Advisor to discuss. With UBC’s diverse, international community there are times when administrators may be asked by a student, staff or faculty member for an accommodation for religious observance. Religion is amongst the human rights which UBC has a duty to accommodate under the BC Human Rights Code.